As we always say here at ManageWP, feedback is the lifeline that empowers us to create an incredible and quality service that we are proud to work on. So to show our appreciation to our community, we decided to run a survey contest for all our paying users. And now it’s time to reveal the winners. We went through all of the survey responses — all 2,500+ of them — and had our fair share of enjoyment going through them. Some responses were funny, and others went bust. Some were very insightful, and others were something else entirely. But it’s all good! But after a solid 10 hours of rigorous review and debate through all the responses, we all have finally agreed to our winners. Team ManageWP sorting through the thousands of entries. Congratulations! 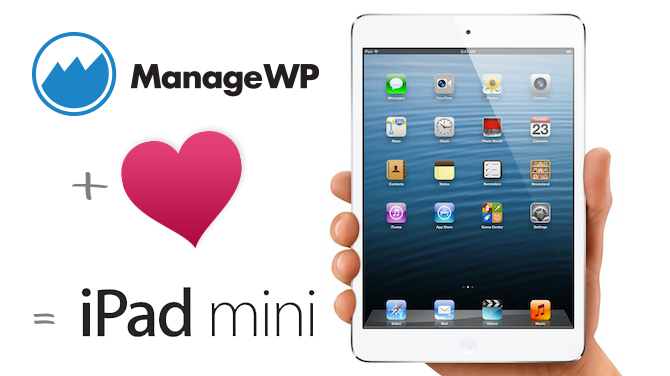 Our contest winners will be contacted shortly with additional details on how to claim their iPad Minis. Didn’t win? Don’t worry, because we will also be sending out 100 ManageWP t-shirts to those of you who provided funny, witty, insightful, and constructive responses. So keep your eyes on your inbox. (If you didn’t win, be sure to check out our swag store, and pick one up for yourself.) It’s just our way of saying thank you for participating and giving us good feedback or a great laugh. We will use all the feedback we have received here to improve ManageWP even further, so thanks so much to everyone who participated and took the time to help ManageWP grow. James is the CEO of ManageWP. He makes sure that everything at ManageWP is running smoothly, and he strives to improve the WordPress community in any ways he can. And if you ever have any questions about ManageWP, send him an email.